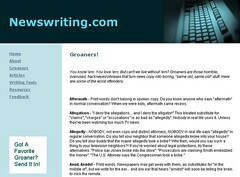 Don’t be a news writing ‘groaner’! According to veteran Amercian TV journalist, Abe Rosenberg, of newswriting.com, when writing for the media (particularly the broadcast media) you should use language that is clear, concise and conversational rather than using jargon or cliches. Major Breakthrough – By definition, there’s no such thing as a minor breakthrough any more than there’s such a thing as a miniature Sumo wrestler. So have a look at it for a bit of fun, and just remember too, that people like to read and hear stories in language they can understand. When you have a great publicity photo idea, ring the Pictorial Editor of your local or state metro paper – it’s as simple as that! That’s exactly what I did for one of my new clients, Catmax. Catmax specialises in making enclosures for our feline friends and one of their most recent jobs was to install a custom-designed Clearnet enclosure on a boat on the Gold Coast – well, what a great photo opportunity! 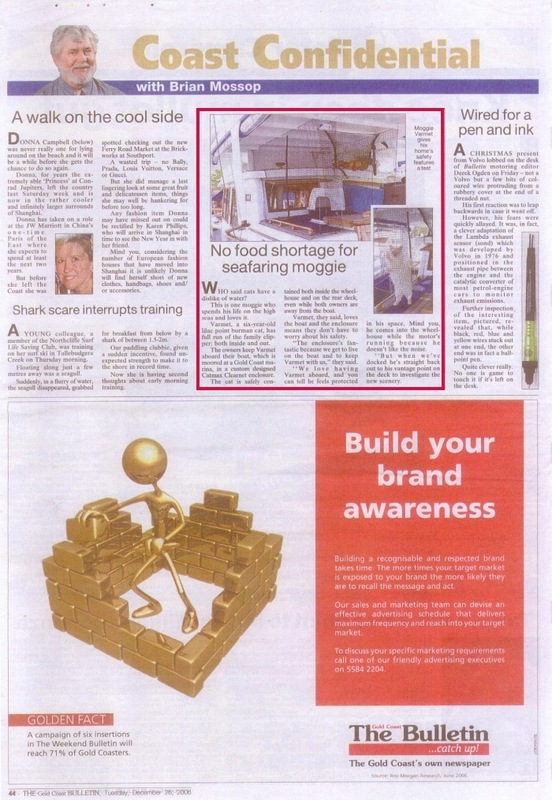 So I made a cold call to Grahame Long, the Pictorial Editor of the Gold Coast Bulletin who liked the idea. He then passed it onto Jenny Rogers, a journalist with the paper who then covered the story. The story ran with two pics on Boxing Day in Brian Mossop’s column – fantastico! So, it really does work! I think Pictorial Editors are often overlooked – but if you can offer them a great pic, then you could well be fast-tracking your way to some major media exposure. Now it’s your turn – what’s your photo? Happy New Year to you all – I hope that 2007 is a sensational one for you and your business. And now is also a great time for getting publicity. Have you noticed how thin the newspapers are at the moment? Well it’s your time to act and try to get some publicity. Here’s a great new year’s resolution for you (as if you need another, right). Make 2007 the year of media coverage for your business! Is there a story idea you can send to the media? Perhaps a great photo opportunity? Perhaps a quirky statistic about your business, products or customers that fits this time of year? and then give it some action! Yours in publicity in 2007!